A few days after we learnt that President Goodluck Jonathan’s wife, Patience Jonathan, was hospitalized in Germany, it has been learnt that Diezani Alison-Madueke, Nigeria’s Minister for Petroleum Resources, is also receiving treatment in a London hospital for a serious medical condition. The medical source and another source close to the minister’s family said that, prior to her recent hospitalization, Mrs. Alison-Madueke had made monthly medical trips to the UK. One source disclosed that she sometimes used private jets arranged by Kola Aluko, a business tycoon with whom she has business ties. 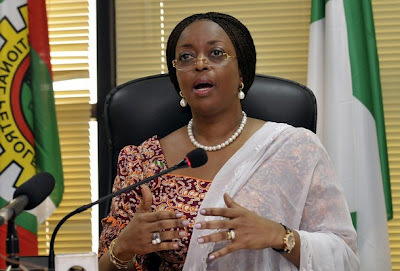 It was gathered that the Petroleum minister owns a jet that is kept in trust for her by Walter Wagbatsoma, an oil marketer recently charged by the EFCC for involvement in oil subsidy scam. It was also learnt that the minister hid the medical nature of her trips to London by telling friends and other government officials that she was going to see her children living in the UK. “For this trip three days ago, Madam said she was escorting her children who were returning to London to continue their schooling,” one sources said. Another source revealed that the minister flew to London few days after accompanying Mr. Jonathan on an official trip to Anambra State. Even though the minister is married, there have been persistent speculations linking her to a romantic relationship with President Jonathan. It was learnt that the president’s ailing wife had complained to her close friends that Mrs. Alison-Madueke had caused her condition because the oil minister wants to take her place at all cost. Meanwhile, a source said that Mrs. Jonathan’s condition has stabilized in Germany where she is being treated for food poisoning. The source said the First Lady came down with food poisoning in Dubai where she had gone on a secret mission to explore undergoing some procedure. The nature of the procedure remains a mystery, but a source at the Presidency said he knew that Mrs. Jonathan close friend, Bola Shagaya, had been persuading her to see a Lebanon-based cosmetic surgeon. The source added that the First Lady was interested in enhancing her looks. The Presidency remains officially silent regarding the nature of Mrs. Jonathan’s current condition in a hospital in Wiesbaden, Germany. Instead, Presidency sources have been releasing snippets of various versions of her condition to different news outlets. A source in Abuja said she suspected that Mrs. Jonathan might have undergone a procedure in Dubai from which she got an infection.